Team USA is headed to its first ever men's curling gold medal game, following a historic upset victory against Canada, the three-time defending Olympic champions and 2017 World Champions. The 5-3 win in Thursday's semifinals caps an earlier three-game U.S. winning streak on the ice in Pyeongchang, an especially remarkable turnaround from a string of losses in the first games of the tournament. Thursday's surge came after the U.S. caught a big break in the eighth end and held on as Canada failed to capitalize on opportunities to shift the momentum. The U.S. has never contended for an Olympic gold or silver medal in curling as they now will against Sweden on Feb. 24. In 2006, the U.S. men won the bronze, the only U.S. Olympic medal ever in the sport. For the Canadians, who have struggled in Pyeongchang, this will be the first time they miss an Olympic curling men's finals since the sport returned to the games in 1998. The Canadian women's team didn't even make the semifinals, despite being the defending world champions. A four-game winning streak has propelled Team USA into the gold medal match. With Switzerland's 3-9 loss in Thursday's other semifinal match at Gangneung Curling Center the Swiss will now play Canada for the bronze. Thursday's U.S. game was tightly contested from the beginning. 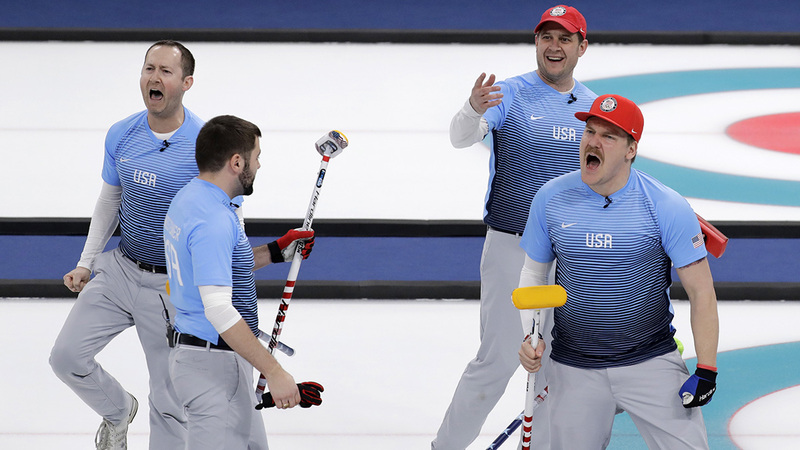 After a scoreless first end, American skip John Shuster's final throw in the second end couldn't push the stone close enough to the button to steal a point from Canada, despite furious sweeping by his teammates. But Canadian skip Kevin Koe failed to capitalize on the hammer, the final throw, and lost out on a chance to score two points. Shuster used the hammer in the third end to tie up the score. Canada then delivered a takeout on the hammer to score a point in the fourth end. The U.S. skip's hammer throw in the fifth end left Canada breathing a bit easy at the halfway point of the match. His double takeout scored one point for Team USA, just missing an opportunity for four. Neither team was able to break the tie on the scoreless next two "blank" ends, raising the pressure for the final two ends of the game. 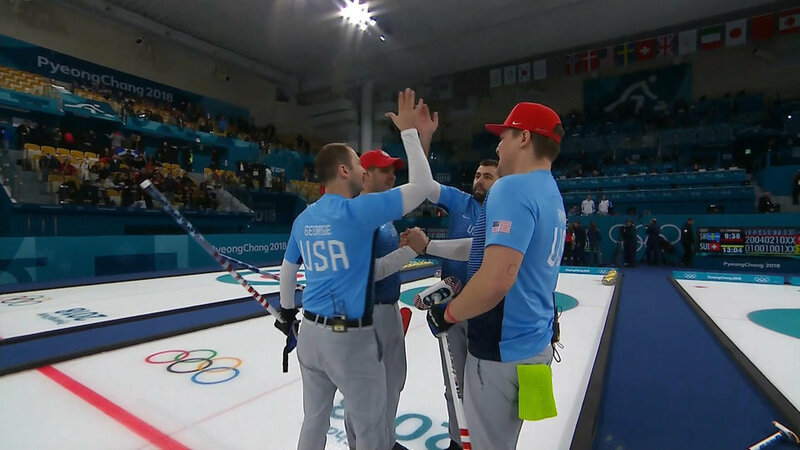 In end eight Team USA finally caught a steal — when a team scores without the hammer — for two points to take the lead. Canada missed an opportunity to score two points in the ninth end, giving the U.S. a one-point advantage as well as the crucial last-stone hammer advantage for the final end. Shuster then sealed the win for the Americans on his final throw, a takeout that scored the U.S. its final point. Shuster and the rest of the U.S. men's team entered the semifinal for the first time since 2006. The last two Olympics for Team USA were less than stellar, to put it lightly. After winning bronze in Turin, the next two Games saw the U.S. finish at or near the bottom of the standings each time. Shuster was even benched at the 2010 Vancouver Games in the middle of the tournament because his performance was so poor. In Pyeongchang it seemed the U.S. was headed for a similar disappointing performance. They went 2-4 in their first matches of round robin play, again in danger of elimination in the first round. But something happened in their seventh game of play. Facing their first battle with Canada, the class of the curling world, Shuster’s team proved that this year was definitely different than Olympics past. In that face-off, they trailed just one time in 11 ends of play, and finished the game with an emphatic game winning takeout by Shuster for two points and a 9-7 victory. It began a three game winning streak to finish round robin play, just like they knew they needed to do to move on. While Thursday's match may not have been a rivalry of sorts (Shuster said he’s actually very good friends with Canadian skip Koe and three of the members of Team USA and two others from Canada are all in a fantasy football league together), George said before the meeting it would be something of a big-brother, little-brother game. But George said that if you’re going to be the best curling team, you know from the time you’re young you’re going to have to go through Canada to get there. So the game was something they have been preparing for for a long time. The Americans acknowledged they now have another huge challenge on their hands against the Swedes.